Having an image that you're capable of bluffing helps get you paid when you're not, Fedor Holz explains. Fedor @CrownUpGuy Holz discusses a key hand from late in his $111,111 One Drop High Roller victory. 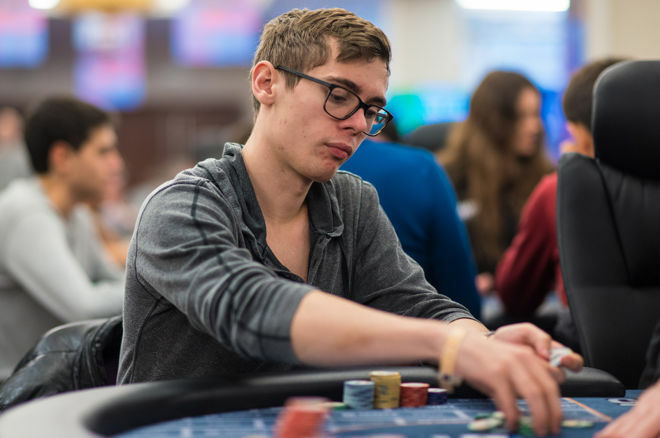 By staying calm and cool under immense pressure, with millions of dollars on the line, 22-year-old German star Fedor Holz has obliterated the fields in high roller events this summer, and over the past couple of years as well. His keen understanding of where he's at in a hand, and in a tournament, plus his ability to play off his image at the table have been keys to his success. Such was certainly the case in the hand that turned things around for him while heads-up for the 2016 WSOP $111,111 High Roller for One Drop No-Limit Hold'em event in Las Vegas on Sunday. Holz had started heads-up play holding a chip lead over Dan Smith, but it wasn't long before Smith snatched it away. Considering that there was a more than $1.9 million difference between first and second place money in the event, there was a palpable tension in the air. All of the momentum had suddenly shifted Smith's way as the tournament's 26th level started, pushing the blinds up to 400,000/800,000 with a 100,000 ante. Holz was playing just over 34 million and Smith slightly under 60 million, when Holz woke up with on the button and came in with a raise to 1.8 million. Holz shared with us his thinking as the hand played out. "At that point, I think we were kind of deep, so I was just raising most of my hands," Holz said of his button raise. Smith looked down at the and fired back, making it six million to go, but could not shake Holz who called with his suited connectors. "When he three-bets, I think it's a good hand to call with in position," Holz explained. The flop came . First to act, and holding second pair, Smith bet 4.1 million, and Holz called with his bottom pair of sixes. The turn then came the , improving Holz to trips. "From then on the hand just kind of played itself," Holz said. "I had a pair on the flop and on the turn I had pretty much the nuts." Smith checked the turn, but called when Holz made a relatively small bet of 5.4 million, not wanting to scare off Smith. Finally, the river came the , improving Smith to two pair. He checked, and Holz chose to push all in for his last 18.975 million, trying to make it look like a bluff was entirely possible. "I think that's why he called," Holz said, keenly aware that his image does a lot of work towards getting him paid off in these kinds of spots. "I'm one of the players in these fields who is capable of [bluffing]," Holz continued. "People have seen me do a lot of crazy stuff, so there's always reason to call me in a lot of situations. I can't blame him." Smith's call meant Holz had doubled up to 69.1 million, leaving Smith with around 22.3 million. The stack sizes weren't the only thing that had shifted. Holz had grabbed the momentum once again, and eventually rode it to victory, collecting his first World Series of Poker bracelet and the massive $4,981,775 first-place prize that came with it.